Comfort food that checks all the boxes. During the cooler months, I spend most Saturdays manning the booth for my chocolate business at local farmers markets. Most of the time, it’s just me flying solo and I am kept busy chatting with people about the wonders of dark chocolate. Not a bad gig, really. But it generally keeps me from enjoying what the other vendors have to offer, namely the farmers. It’s a first-come-first-served deal and by the time I make it over at the end of the morning, most of the goodies have been claimed. So most would call me crazy, but I look forward to the warmer months when my Saturdays are mine again and I can make it out early to the nearest market, where even in Phoenix you can find some really fresh, delicious veg. Sugar snap peas, red peppers, fresh herbs, and cage-free eggs. The eggs are $4 a dozen, which is less than what you’ll often pay for a supposed similar quality at the grocery store. And in this case, I know the farmer who cares for his hens and I know they didn’t come across states to get to me. Eh, I know it’s cliche and over-talked about these days but as J and I persistently try to focus our diet and make better choices, we’ve taken on the less is more approach. When less is more, it’s quality over quantity every time. I read this awesome blog post this week at Small Notebook and felt reinspired to find contentment in a balanced grocery budget, where we are regularly satiated by nutritious foods that honor our bodies rather than over stuffing ourselves with low-grade, mass-produced items that never satisfy quite the same. This frittata comes together so quickly and the smashed baby red potatoes are an easy alternative to a cubed breakfast potato or hash brown. The potatoes are par-boiled while you prep for the frittata. Once slightly tender, they’re removed and smashed flat to sautee until crispy. I use a cast iron skillet for both the potatoes and then straight in with the frittata. You’ll get the most even heat and golden brown color in a short timeframe. The veggies are sauteed ever so slightly, as to not lose the vibrance of color and flavor before adding the egg and finishing under the broiler. 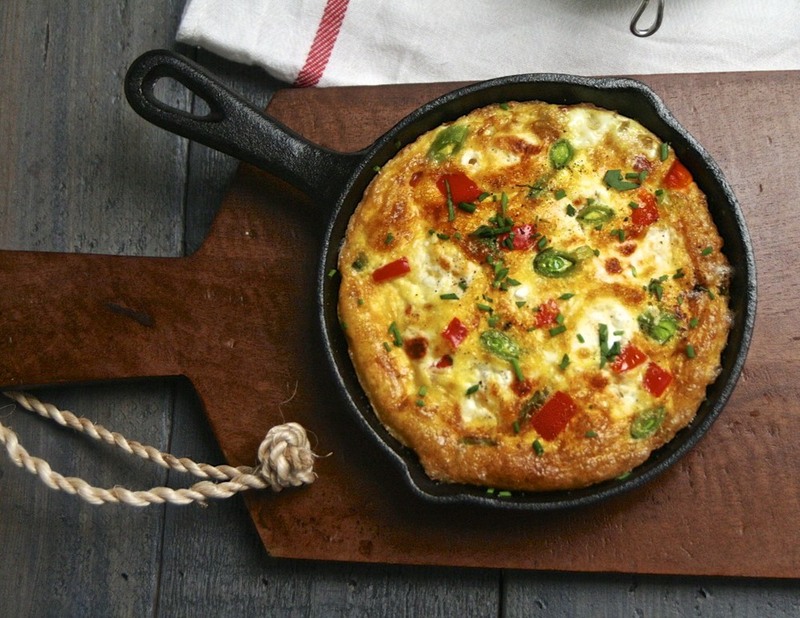 I’m grateful for beautiful flavors found in a simple frittata. I’m grateful to have markets close that give us access clean, quality foods. Do you shop at the market? How do you keep your grocery budget in line with the way you like to eat? Preheat oven to broil, low broil if your oven has it. Heat an 8-inch cast iron skillet over medium heat. Place avocado oil, veggies, and spices into the skillet and sautee lightly, about 2-3 minutes. Beat eggs well with water and add to skillet, swirling slightly as the bottom begins to set. Leave on the heat another 2-3 minutes to allow bottom to brown. Place the skillet under the broiler. If on low broil, leave for approximately 3-5 minutes, monitoring regularly. If on high broil, 2-3 minutes and watch even closer. When the egg is puffed up about 50% greater in volume and the surface is golden brown, remove from the oven and let cool slightly before serving. Sprinkle with fresh herbs leftover from the smashed potatoes. In a medium saucepan, par-boil potatoes in salty water (about 1 t. salt per cup of water), about 8-10 minutes. You’ll know they’re ready when you can barely begin to insert the tip of a fork. Drain water and let cool briefly. Heat a cast iron skillet over medium heat with 2 T. avocado oil. Using a kitchen towel, place a whole potato on a clean cutting board and place towel on top. Pressing gently, flatten the potato slightly. Be careful not to press too hard, as you want to leave the potato intact. Place the potato in skillet and repeat with remaining potatoes. Sprinkle with salt and pepper. Cook on one side until golden brown, about 3-5 minutes. Flip potatoes and cook another 3-5 minutes. Turn the heat off and add a drizzle of EVAO, minced garlic, and fresh herbs. Toss together and let warm another 1 minute. Remove from heat and enjoy.